The Epic Foundation is proud to assist Netcare sexual assault centres over the entire South Africa, with comfort packs in an effort to assist survivors even further. Netcare’s 37 sexual assault centres, which are integrated into emergency departments at the group’s hospitals, provide survivors with an invaluable service in a time of great need. This includes medical, emotional and psychological support, sanitary care and assistance with forensic and reporting aspects. Netcare respects the survivors’ right to privacy and therefore maintain strict patient confidentiality. Netcare remains the only private healthcare provider in South Africa to provide this crucial service on a national and sustained basis, 24 hours a day, 365 days a year. Over 10 000 survivors were assisted at Netcare sexual assault centres between 2001 and 2013. Eighty percent of the survivors who received free treatment and support were not covered by medical aid and were without the means to pay. 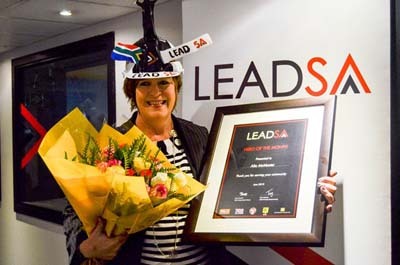 Blow the Whistle aims to give women and children the platforms they need to feel safe in South Africa. Starting with fashionable, physical whistles and a state-of-the-art mobile app, the initiative is making sure that women never have to feel alone. The campaign not only seeks to give women a voice against crime, but also encourages men and other citizens to react to the call of need, activating the community to work together against crime. The proceeds of the sales are being channelled to the DNA Project and the development of DNA forensic technology. It’s time to take action. It’s time to make a change. It’s time to realise that this problem is closer to home than you think. A mother, a sister, a girlfriend, fiancé or a friend - will you speak for them? Will you take action on their behalf? Will you protect the children who walk home alone from school? 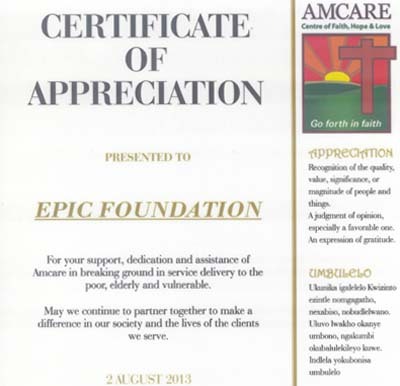 For your support, dedication and assistance of Amcare in breaking ground in service delivery to the poor, elderly and vulnerable.